Today Mom feels more tired. She felt slight twitches on her arm and left breast. Her mood is not as hyper as the first 2 days. Maybe caused by stress from shifting of hotel, anger with the taxi driver who took us for a joy ride and shopping at Computer Mart. She said she did not sleep well, however, I heard her snored last night. 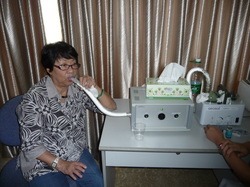 To relieve her tiredness, another NGPDT Specialist Dr. Kong 孔 recommended her to inhale oxygen. 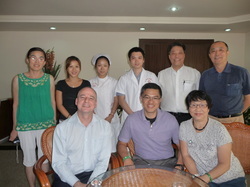 Dr Kong said that the muscle twitches and tiredness are caused by Lactic acid which inhalation of Oxygen would relief. Today Mom is very tired and grumpy. Her cheeks are still quite rosy. 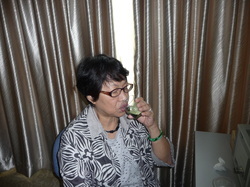 WIth the extra inhalation of pure Oxygen for 1 hour, it will help the chlorophyll effect (photosynthesis). Also it should relief her of the lactic acid built-up from physical exertions. 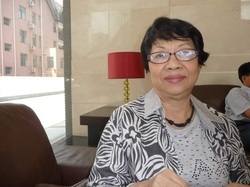 She was happy that Dr. Lim complimented her for being cheerful and youthful. The Doctors discussed her case in details today. They may recommend that due to the large size of the tumor, and that it is localised, it would be good to have it surgically removed after the NGPDT course. They are not certain at this moment whether it would be remove after the first NGPDT course or after the second course. Any tumor greater than 0.3cm may need surgery. 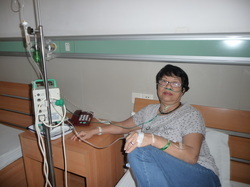 The other method is to let her repeat the NGPDT course a second time, and during that time, insert a catheter into the center of the tumor and shine a light from inside. This would totally destroy the tumor from inside out.